If you’re an early retirement seeker like me, then here’s some good news: The Roth IRA early withdrawal rules make it really easy to get your money out before age 59-1/2 without penalty! Yes, classically a Roth IRA is supposed to be used to provide savers with the opportunity to enjoy tax-free retirement income later on in life. Who doesn’t want to NOT have to pay taxes during retirement? But if you understand the in’s and out’s of the rules, they can also be used to provide retirement income in thus difficult years between an early retirement and age 59-1/2. It’s a very simple and easy-to-execute strategy. But you still have to be careful! There are some important rules to keep in mind. In this post, we’re going to talk about how you can work this little-known loophole into your early retirement hacking plan. Before we get into this strategy, let’s first talk about the different parts of just what makes up a Roth IRA. As you probably already know, a Roth IRA is a retirement account where you save your money using after-tax dollars. That means at the end of the year when you file your Federal income tax return, you do NOT get credited for contributing to the Roth (and hence taxes are paid on that money). The upside, however, is that your savings grows tax-free for the life of the account. Once you’re ready to retire (after age 59-1/2), you get to take out the money tax-free to use for your living expenses. A lot of people see this as being a great feature because when you’re older and retired, who wants to have to pay taxes? 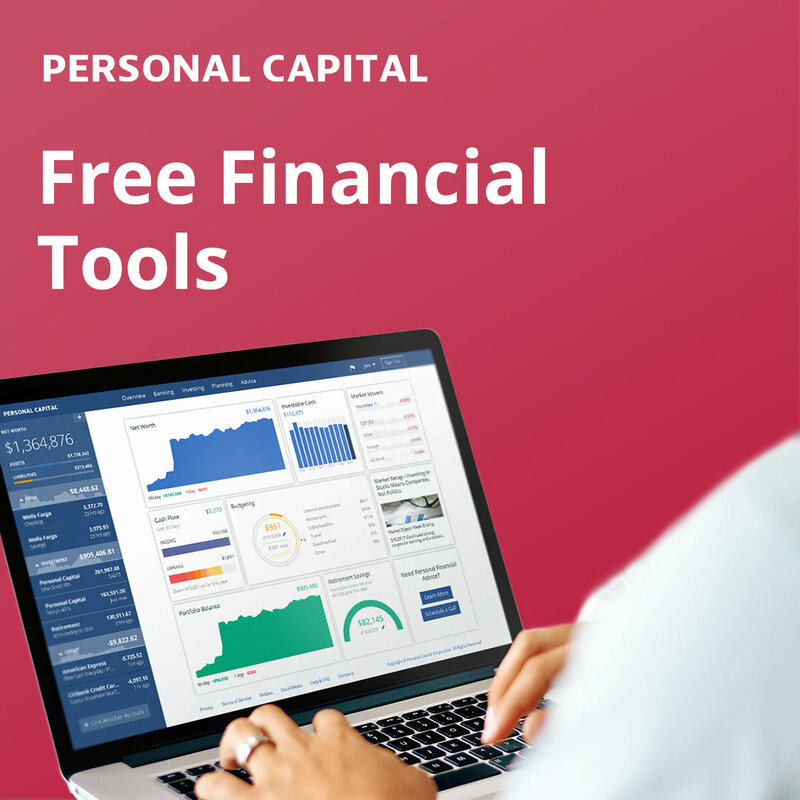 While having tax-free income later on in life is a really cool thing to have, a Roth IRA also has another really useful built-in benefit: You can pull out your contributions whenever you want to. That’s right! Because your Roth IRA contributions were funded with after-tax dollars, the government doesn’t care when you access this money. Since you already paid your dues on this income, its yours to do with as you please – tax free. Your contributions – the money you saved. This is the part you CAN take out whenever you want. Your earnings – the money that grew on top of your contributions. This is the part you can NOT take out until you turn age 59-1/2 without penalty. If you contributed $20,000 over the course of 5 years, and your balance was $25,000, then you’d be able to withdraw $20,000. The other $5,000 would be the earnings and ineligible for early withdrawal. Make sure your Roth IRA passes the five year rule first. What’s up with waiting for five years? Officially according to the IRS rules, you’ll want your Roth IRA to have aged at least five tax years before pulling out any of your contributions from it. Otherwise your earnings won’t be what they call “qualified” or tax-exempt when you go to pull them out after age 59-1/2. In other words: Even though you could pull your Roth contributions out any time you want, there is a danger there of inadvertently making the earnings taxable if you make your withdrawal too quickly. You’re under age 59-1/2 and you start a Roth IRA. 3 years later, you withdraw your contributions. You can do that, but the earnings on those contributions are no longer tax-free or penalty-free. If you keep the Roth open, allow it to age five years or more, and you become at least 59-1/2 years old, then the earnings would become tax-free. This would go for both any earnings you had accumulated before you withdrew your contribution and after. The good news: The clock starts when you make your first Roth contribution. Once you’ve opened your Roth IRA and it has aged for at least 5 years, the requirement is satisfied. You don’t have to wait another five years for each set of contributions. In year 6 if you contributed $5,000 and suddenly had an emergency, you could turn right back around and pull your contribution out without affecting the earnings. Note that when we say “tax years”, we mean the year your contribution counts; not necessarily when you made the deposit. Example: You contributed to your Roth IRA in 2015 but it counts towards your 2014 tax year. Since tax year 2014 starts January 1st, 2014, this means that January 1st, 2019 your Roth will have aged 5 tax years and satisfied the five year requirement. Now you can withdraw your contributions and the earnings will all count as tax-free later on. 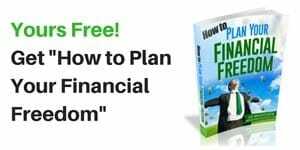 If you want a ton of more detail, financial writer Michael Kitces has a really helpful article that explains this scenario far more thoroughly. Let’s say you plan to retire early at age 50. If you can’t touch your retirement savings until age 59-1/2, then what do you do about the next 9-1/2 years? That’s been one of the big struggles for anyone trying to lay out a strategy for how they can fund those early years before they can access their savings. But as you can see, the perk of being able to access your Roth IRA contributions is one of the tools you can use to help bridge these early years. Though it probably won’t fund the entire thing, it’s very likely that you could produce $500 to $1,500 of monthly tax-free income to help cover expenses during these first few years (depending, of course, on how long you’ve been contributing and how much money you’ve got saved up). I know I’m planning to use it as part of my master early retirement strategy! Combine this with any one of our other early retirement funding strategies (72T, backdoor Roth IRA ladder, dividend income, etc. 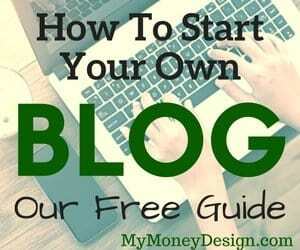 ), and you’ve got yet another way to accomplish your overall financial freedom strategy. Of course the big elephant in the room when it comes to using this strategy is the danger of running out of money too soon. This is why you have to really put some thought into how you want to structure not just your early retirement, but your whole financial future. Don’t risk having no money to live on by the time you’re 80, 90 or even 100 years old. Plan your withdraws sparingly! 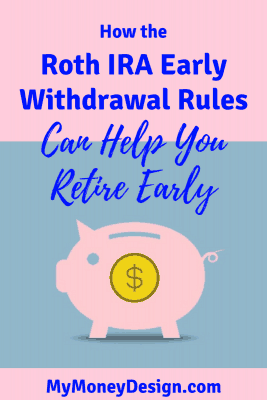 Readers – How many of you plan to use the Roth IRA early withdrawal rules to help bridge the gap between when you retire early and when you can officially touch your retirement savings? Wait, I thought that each contribution had to wait five years before it could be taken penalty free? I know that was the case in your Backdoor Roth IRA Contribution plan. Or is there a difference based on whether the contribution is coming from non-qualified funds vs pre -tax money in a traditional plan? As for the possibility of running out of money early, what’s your thoughts on the idea of rolling over the funds from a Roth IRA to a fixed annuity? Being now a Roth IRA annuity, distributions should be tax free. And if you annuitize, you should have a stream of guaranteed lifetime income. You wouldn’t have to worry about running out of money early. Good question, and its easy to confuse the two things. Think of them as being two different five year rules. The first five year rule applies to your gains when you’re regularly saving . Even though you can always withdraw your Roth principal anytime without penalty, it has to be open for a minimum of 5 years with no withdrawal of principal in order for the gains to be considered tax-free after age 59-1/2. The second five year rule applies to your contributions if you do a backdoor Roth IRA conversion. Here, you have to wait five years for each amount converted until the amount you converted is available for withdrawal. The Kitces article I linked to has a much more in-depth explanation of the two. In general, I’m not a big fan of annuities – mostly because you end up surrendering your principal for maximum benefit. I don’t know of any that allow you to take distributions before age 59-1/2; so this does not help our early retirement strategy. If you can save more during your accumulation years and adjust to live on a lower withdraw rate (say 3% instead of 4%), then you can create an almost virtual ~100% guarantee of never running out of money. Thanks for discussing the Roth IRA, MMD. I know that that tricks work. This is from the Kitces article you reference: “However, it’s also important to bear in mind that even if the withdrawal is principal and not subject to ordinary income taxation, if it is a conversion amount within the 5-year time window, the withdrawal may be subject to early withdrawal penalties even if it is not otherwise taxable.” The key word is “conversion.” The article does not say that money contributed to a Roth IRA would be subject to taxation or penalties before the five-year period, and multiple sources say it is not. . Example: Say you started your first Roth IRA and on the 4th year you decided to withdraw (only) your contributions. You can do this, but any earnings you’ve made up to this point are now no longer tax-exempt (after age 59-1/2) because your contributions did not satisfy the five year rule. Had you waited one more year to make your withdrawal, the five year rule would now be satisfied and your earnings are now tax-exempt (after age 59-1/2). But in either case you can’t withdraw the earnings before age 59-1/2 without penalty. Only the contributions. You are confusing the issue. I never said that earnings can be withdrawn in under 5 years for someone under age 59.5. I only referred to contributions. You claimed that contributions cannot be withdrawn in under five years free of taxes, the whole point of your article This is wrong. Regarding the third paragraph, your faulty assumption is that a withdrawal always has to be “qualified” to be free of taxes. This article should clarify this false assumption:: http://www.rothira.com/blog/understanding-non-qualified-roth-ira-distributions. Please consider correcting or retracting this article. That is actually not the point or message in this article at all. The article clearly states “You can pull out your contributions whenever you want to” and then reiterates this point a few more times. That is the message: That you can use your Roth IRA contributions tax-free and penalty-free to bridge the early years between an early retirement and age 59-1/2. I only bring up the five-year rule as a caution to those savers who may not have allowed enough time for their Roths to age yet. In another context, I have heard many financial professionals recommend to use a Roth IRA as a sort of emergency fund. And while this is not necessarily a bad idea, you could end up causing trouble for your earnings later on down the road if you don’t recognize this rule first. I will add a few clarifications to make sure this point is absolutely clear. I think you should clarify a bit. Withdrawing a contribution before the five-year waiting period does not make a subsequent withdrawal of earnings taxable as long as the withdrawal of earnings is qualified, i.e., done after age 59.5 and five tax years after the first contribution to an IRA. Agreed, and I appreciate your persistence in making sure the text expresses this topic clearly. I will make a clarification.